Democratic Diva » Robert Robb is correct, but also mistaken, in his analysis of Top Two Primary. The principal objective of the top-two primary initiative shouldn’t be sugarcoated. It isn’t to increase voter turnout or eliminate discriminatory barriers to independent candidates. Those might be desired byproducts. But they are not the main event. The principal objective, the main event, is to reduce the influence of conservative Republicans in state government and politics. Those who don’t like the outcomes of Arizona elections want to change those outcomes by changing the rules. Plainly stating the principal objective shouldn’t settle the argument, even for conservative Republicans. For there is something else that should be plainly stated: The current system of partisan primaries doesn’t fit today’s political demography in Arizona. Under the current system, state law establishes conditions for having a political party recognized. Taxpayers pay for recognized parties to hold primary elections to select their general election candidates. Parties get other advantages, such as preferential access to the voter roll. Robb is correct that claims of Top Two increasing turnout or helping “independent” candidates get elected are howlers to people who pay anything resembling close attention to Arizona elections but possibly plausible to those who don’t, hence such claims being at the forefront of selling the initiative to the general public and certain gullible pundits. And Robb is on point with his assertion that the traditional primary system does not reflect current registration figures (a third of the state’s voters are not officially affiliated with any party) and the case he makes for removing taxpayer funding of partisan primaries is a solid one. It is objectively the best argument for changing to an open primary system. Nope! 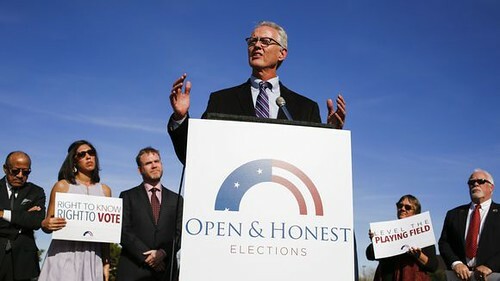 While it is true that many supporters of the measure who are “in the know” like the idea because they feel jungle primaries would moderate the more conservative elements of the GOP, that does not appear to be the top priority of the people behind Open Primaries. In my previous post I demonstrated how the Top Two organizers are engaging in strategies and rhetoric that do not appear to be directed at remaking the Republicans in Arizona so much as at demolishing the Democrats. If you want to replace the John Kavanaghs in safe suburban Republican districts with Bob Worsleys, then it simply makes no sense whatsoever to be doing outreach in urban Democratic districts to convince the voters there to abandon the Democrats. Assuming they succeeded, how exactly would increasing the number of Republicans in the AZ legislature to a percentage far beyond veto-proof do anything to moderate the Republicans? You’d have a giant GOP caucus of conservatives with a small caucus of “moderate” Republicans within it that would have no more ability to check the right wingers than the Democratic caucus currently does, and probably less because they wouldn’t be an organized opposition. But what you would have is a whole bunch of very “business friendly” legislators putting forth little to no resistance to the agenda of the public pension-plundering hedge fund managers, private prison lobbyists, and any other corporate hangers-on who are very eager to get this Top Two thing passed. I’m sorry, but any plan to moderate the Republicans here that doesn’t involve electing more Democrats to force that to happen (because they’d have real competition!) is doomed to fail in that endeavor. It is especially galling that Top Two has been paired with Terry Goddard’s Dark Money initiative in such a way that Democrats are expected to participate willingly in their own destruction.